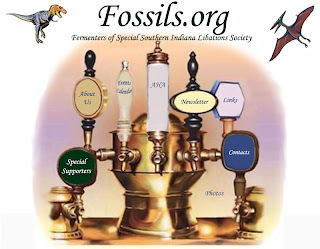 Happy Thanksgiving to all FOSSILS and their families, as well as other homebrewers near and far. I hope the time with family and friends includes wonderful homebrews and many of your favorite delicious craft brews. I. personally have a bottle of Trappistes Rochefort 10 and a Chimay Grand Reserva Blue Label in my stash to get me through the weekend, as well as a few of my own homebrews. May you enjoy wonderful time with family and friends. After all was said and done, there were 22 entries. Entries came from as far away as California, Ohio, and Michigan. Ed Tash organized a crew of judges doing each a yeoman's work. Special thanks to Tac the ever-present steward for his assistance in making everything move like clockwork. The Long-distance Brewer Award goes to our California entrant; Chris Hayes! Prizes this year include gift certificates, award certificates, and etched club classes. Awards and score cards should be going out soon. Thanks again to everyone who participated! See you next year! Time: 6:30 p.m. - 11 p.m. This year, the Christmas party will be at the Capshews. As always, everything is covered; Appetizers, Dinner, and Dessert! * Bring items for the raffle - gift wrapped if you wish - this is one of the best raffles of the year! * Dress festively if you are in the mood to do so! Event cost: $15 per person, payable by check or cash at the door, includes appetizers, dinner, homebrew and dessert. Please bring your homebrew! If there is something you wish to bring (desserts, raffle items, reindeer, homebrew) please bring them and share the holiday spirit! RSVP: We need to deliver a headcount for catering, so please try to RSVP via email (fossils.editor@gmail.com with the number attending in your party as soon as possible. Last night was the official registration of entrants into the Fossils 17th Annual Porter Competition! Ed Tash informed me via email last night that this year's count was 19 entries with a possible 20th via extraordinary rendition today. Entries from the usual suspects where there as well as entries from Ohio, Michigan, and as far away as California. Saturday's event should be a great one! Reminder: Next Club Meeting is this Saturday! 11/14!!! Just a quick reminder that this weekend is the Annual Porter Competition! Entries need to be at Richo's today for entry! (I believe that Ed Tash will be counting/processing entries for Saturday's competition at 7pm, FYI). I expect that the newsletter will post tomorrow (I'm under the weather, but I can type), let me know if there is anything that needs to be added!!! Registration is now open for the 32nd annual National Homebrewers Conference which will be held June 17-19, 2010 in Minneapolis, MN, at the Sheraton Minneapolis South. You can expect an amazing conference as the Twin Cities is home to the St. Paul Homebrewers Club, the AHA´s Homebrew Club of the Year for three years running. Register today to ensure your place at what promises to be another record breaking conference! Yes, unless you are completely new to the site, you may have noticed that this isn't the old homepage for the FOSSILS. We are currently experimenting with changing the format of the site. I believe that all of the old homepage's site is contained within this blog or has a link to it. This is a work in progress so let me know if you see something missing or would like to add something. Pages will redirect you to this site, not the index page (at this time), so be forewarned! FOSSILS PORTER COMPETITION Entry Form!